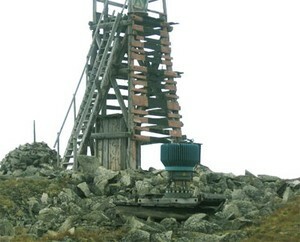 ST. PETERSBURG – At the end of March near Norilsk in the Krasnoyarsk region, four of eight unguarded Radioisotope Thermo-electric Generators (RTGs) with strontium-90 power cores were dismantled by non-ferrous metals scavengers. Bellona learned of the incident from local residents. Because of a lack of funds at the end of 2005 during the transfer of a branch of military guard 96211 from territory occupied 60 kilometers to the south of Norilsk, the RTGs were left without any kind of human protection. The vandalism of the units was discovered only at the end of March, but no official announcement was made. According to some sources, the RTGs are still unguarded even now. The Bellona foundation considers that the Chernobyl incident was most likely the result of human error. What is happening now near Norilsk shows that the atomic sphere, where any mistake runs an extremely high cost, cannot be protected from similar slovenliness―and Chernobyl-like absentmindedness threatens us even 20 years after that disaster. Bellona and other NGOs in Russia learned of the incident from local residents. Today Bellona has sent an official inquiry about the measures being undertaken by the General Prosecutor’s office and the Military Prosecutor of Siberia’s Military region to deal with the consequences of the incident. Each RTG has a capsule of highly active strontium-90―a radioisotopic heat source. A large number of RTGs were manufactured between 1960 and 1980 to operate lighthouses situated along unpopulated coastlines. Today, when strontium can easily end up in the hands of terrorists and thus be employed in a dirty bombs, this is an unacceptable security situation. With the help of western nations, Russia is decommissioning these devices. The list of incidents with RTGs—including the leakage of strontium into the environment in 2004 at Cape Navarin—have been included in a working document produced by Bellona. A commission of the All Russian Institute of Technical Physics and Automation (VNIITFA in its Russian acronym), which developed RTGs between 1960 and 1980s, is expected to arrive in Norilsk. However, no concrete agreement for their arrival has been reached. “The negotiations on the export of these RTGs are being carried out, and we are ready to transport them, but the question is when the organization that has been exploiting the materials can pay for the work,” said Anatoly Platov of VNIITFA in an interview with Bellona Web. “The question is only now being decided, but the RTGs need to be removed immediately. If this continues then by the summer they will all have been dismantled and vandalized,” according to a local resident in conversation with Bellona Web. Eight unguarded RTGs of the Gorn type compose the Gletcher energy complex. Every RTG of the Gorn type has a thermal capacity of 1,100 watts, and an electricity-producing output of 60 watts. The radioisotope source of heat possesses 170,000 curies of radioactivity. In the branch of the military unit 96211 (the central office of the unit is located close to Dubna in the Moscow region) these RTGs, installed in 1992, were used for fueling special equipment. According to the data received by Bellona Web from sources in Norilsk, metal thieves have removed the metal protective covering of the RTGs and left the strontium in place. The activity of the radioisotope heat source in Gorn RTGs, of the type vandalized near Norlisk, is almost 5 times higher than in Beta-M RTGs. According to Norilsk officials, the thieves, who apparently used cross-country vehicles to reach the RTGs, where detained and criminal charges have been filed. “I haven’t been informed [that RTGs were vandalized]. I have information, that within 60 kilometres of Norilsk, where a closed military unit had been situated, there are RTGs. They are controlled, but unguarded: an officer visits them occasionally,” said Vladimir Prilepskikh, the head of the Siberian branch of the Federal Service for Energy, Technology and Atomic Oversight (FSETAN in its Russian abbreviation). Prilepskikh told Bellona Web that last week the RTGs were inspected by representatives of the prosecutors’ office, and that this week they should be inspected by the Emergency Ministry and the Federal Security Service. “The owner of these RTGs is the Defense Ministry. And while the Defense Ministry is in some ways a state inside a state, RTGs are not controlled by us”, Prilepskikh said. Currently, following governmental decree 1007 issued September 4, 1999, and directive D-3 of the Defence Ministry, nuclear oversight service grants licenses and inspects Defence Ministry RTGs, as they are considered nuclear installations that do not pertain to military use. But, in fact, it is the Defence Ministry that is responsible for radiation and nuclear safety in the military units, so the control in the military areas is executed by military nuclear regulatory bodies, and nuclear regulators of the FSETAN often do not have access to military RTGs. “As citizens we are outraged that such things happen, and as the representatives of state [ nuclear] oversight we want everything to get back to normal. But we are not listened to,” Prilepskikh added. A Defence Ministry press service representative, Yuri Ivanov, refused to comment the situation, saying Bellona Web should send a written inquiry to the Ministry. Norilsk has already seen a similar incident. Three derelict RTGs were found on the territory of military unit 40919. According to the unit commander, these RTGs were left by another military unit, previously based at this site. The Krasnoyarsk branch of FSETAN reported that radiation doses at a distance of one metre from the RTGs exceeded natural background radiation by 155 times. Rather than solving the problem within the Ministry of Defence, the military unit, in which RTGs were found, sent a letter to the Kvant radiation technological company in Krasnoyarsk, asking them to remove RTGs for disposal. “There is one problem with RTGs: they all have surpassed their service allotment,” said Prilepskikh. Between 1960 and 1980, the Soviet Union produced about 1500 RTGs, and all of them have long exhausted their 10-year engineered life spans and are in dire need of dismantling. The urgency of this task is underscored by the recent incidents with these potentially dangerous radioactive sources. At best, any given RTG is inspected once a year. “Russia brought the matter up to the international level, now the country receives money to solve the problem from the West. Though in my opinion, we should have our own money for this,” Prilepskikh said. Currently, RTGs are removed and decommissioned with assistance from Norway and the United States. Russia is also negotiating the possibility of aid from Germany, Canada and France. Negotiations on creation of a master-plan to decommission all the RTGs are going on as well. The possibility of such a master plan was laid out in the Group of Eight Industrialised Nations’ (G-8) Global Partnership annual report of the Gleneagles G-8 Summit in 2005. This master plan would be akin to the recently published master-plan on decommissioning of the nuclear submarines and several other objects in Northwest Russia. Such a mater plan should stipulate all the priority measures, and transparency in spending by Rosatom. The lack of transparency in spending international support funds has often been criticized, including in a report by Russia’s Audit Chamber. The report, analyzing activities of Minatom (Rosatom’s predecessor ministry) in 2002, mentioned that Western donors pay two times more for the same decommissioning operations Russia carries out. Bellona states that the only guarantee of transparency in carrying out decommissioning projects can be public participation. In a letter received by Bellona on April 10th Rosatom promised that “public consultations on the RTGs master plan will be held”. In the beginning of April 2006, Rosatom signed an agreement with Canada, according to which Canada will fund a feasibility study for the preparation of the RTGs master-plan. Apart from Rosatom, the Russian group to prepare such master-plan is comprised of the Defense Ministry, the Ministry of Transportation and FSETAN. According to what was written in the Rosatom letter, currently “at various locations in Russia there are 651 RTGs, which are subject to decommissioning or replacement with alternative sources of energy”. With Norwegian financial aid, RTGs in the lighthouses of the Russian Northwest have been replaced with solar panels. The co-operative agreement is scheduled to last though 2008. From the beginning of 2001 to the end of 2005, 295 RTGs have been removed from the coasts of the Northern Shipping route; of these 214 have been dismantled. In 2005, 65 RTGs were removed, including 24 from the Northern Shipping route coasts. The problem of derelict sources of radiation is not limited only to RTGs. Other sources exist as well, and as a rule local administrations lack funds for their removal. “The problem with derelict sources of radiation is very acute. We find two or three such sources every year. And it has become ordinary. In my opinion, it happens because no one wants to establish order. In 10 years we have found not a single owner of the derelict sources,” Prilepskikh said. According to Prilepskikh, the only region in the West Siberia where such problem has been resolved is the Irkutsk region: “The city administration made an agreement with the Radon combine, paid money, and now Radon comes and takes the sources away”. Radon combines, situated in 15 Russian cities, are designed only for handling low- and medium-level radioactive waste, while RTGs pertain to high-level waste. There are no such agreements in the Novosibirsk region, said Prilepskikh. “The governor simply calls to the Novosibirsk plant of chemical concentrates and asks to take radiation sources away,” he said. Prilepskikh also mentioned that local administrations are held responsible for the sources, which were owned by subsequently bankrupted companies.